Here is a clay project Grade 6 has been doing for the last several years....a clay Poinsettia candle holder. (Great project Mr. Z!). You could also make these out of salt dough or air dry clay (Prang) if you don't have access to a kiln. I was helping out last week but forgot to take pictures of the process so you'll have to settle for my notes. Take a slice of clay and roll out to about 1/2 inch thick. Using a skewer cut 10 petals. 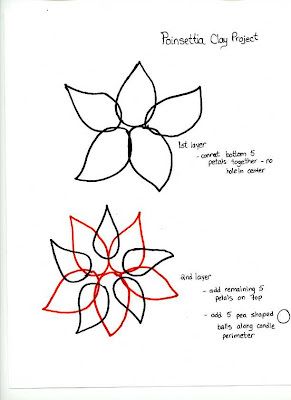 You can use my template Poinsettia Petal. Starting with the bottom layer...lay out 5 petals, slightly overlap them. Scratch and add a little water on the surfaces that touch in order to "glue" them together. You want a solid center so squish the clay together to form that center. The second layer of petals goes on top of the bottom layer but the petals lay in between the space of the petals of the bottom. Something like this....click on pictures to see larger. We used a cup that was the same size as a votive to make an impression in the center...this is where the candle will go. We then rolled out 5 small pea sized balls and set them around the outside of this impression at equal intervals. Remember to "scratch, scratch,water, water" all surfaces that are touching to glue them together. They had an option of curling up their petals if they wanted and they scored the veins on their petals for texture. They should look like this when finished. Let dry for 1-2 weeks, bisque fire, glaze, and then fire again. If using salt dough or air dry clay, paint with acrylic and add a coat of Mod Podge to seal. This is the one my daughter made last year. Grade 6 will be glazing theirs this week. I have a simple paper Christmas Tree to post as well. We will be doing it for Christmas Craft Day which is being held on Friday Dec 18th. Unfortunately the weather has been so gloomy I have been unable to get any decent photos and my photo assistant has been getting in the way! I'll wait till tomorrow to see if I can get some good natural light. Not sure how i got here...BUT I LOVE your blog and am bookmarking! Thank you! Great work Gail! Hope you don't mind me doing these with my students....Thanks for posting.